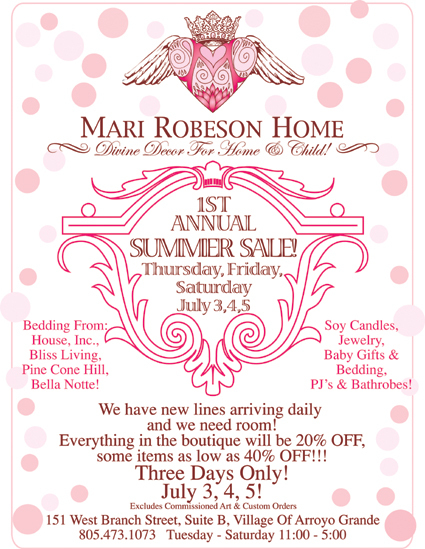 1st Annual Summer Sale! July 3rd, 4th, 5th! There's a first time for everything and this is my First Annual Summer Sale! The truth is I just bought into 4 new fantastic lines and have some lovely new products coming into the boutique...the problem is, THIS IS A TEENY TINY STORE! Those of you who have been here know what I'm talking about! :-) So it's time to have a Sale! For three days only, Thursday, Friday, and Saturday from 11:00-5:00, everything in the store will be 20% OFF! Some items, as much as 40% OFF! After the Sale, I'll be moving things around quite a bit and giving a new look to my little jewel box so you'll have to come back and check out the new stuff too!!! So Save The Date & I'll Look Forward To Seeing You There! (just a little disclaimer - the sale will not include any of the artist that I have on commission here - we want to support the arts - right? and the sale will not be on any custom orders, only items In Stock and on the floor).